On rare occasions, I dream about being a politician or high-level international bureaucrat. Not because I want to be a moocher (please put me out of my misery if that ever happens), but because I periodically read about some sleazy interest group making petulant demands for handouts and I think about how much fun it would be to tell them to go jump in a lake. In some cases, the sleazy interest group is an entire nation. Greece recently took a bailout from both the European Union (i.e., European taxpayers) and the International Monetary Fund (i.e., all taxpayers). In exchange for getting a handout, Greek politicians agreed to implement a bunch of deficit-reduction policies. But like many welfare recipients, the country of Greece has an entitlement mentality and is now whining and complaining about having to live up to its side of the bargain. Actually, if I had that power, Greece never would have received a bailout in the first place, but I think you know what I mean. Here are some excerpts from the Reuters report about Greece’s chutzpah. Fiscal policy wonks (like me, I’m forced to admit) sometimes miss the forest because we focus too much on individual trees. So while I think my posts on the spending and revenue sides of Obama’s new budget contained lots of useful information, I didn’t pay any attention to the elephant in the room (I’m really going overboard with metaphors, huh?). The most important number in Obama’s budget is that he is proposing $5.7 trillion of spending in 2021, about $2 trillion more than is being spent this year, according to table S-1 of the budget. Here’s everything you need to know about Obama’s budget, in one chart. It’s important to make three additional observations. First, Obama’s budget is based on all sorts of optimistic assumptions and rosy scenarios, as explained by Brian Riedl of the Heritage Foundation. When CBO produces a re-estimate of the President’s budget, it almost certainly will show hundreds of billions of dollars of additional spending. Second, the slope of the line if the graph is very revealing. The first two years look very impressive, with almost no change in spending, but the goal of fiscal policy, to borrow a phrase from the health care debate, should be “bending the cost curve” of government. Short-run gimmicks, to put it mildly, don’t have any long-run impact. 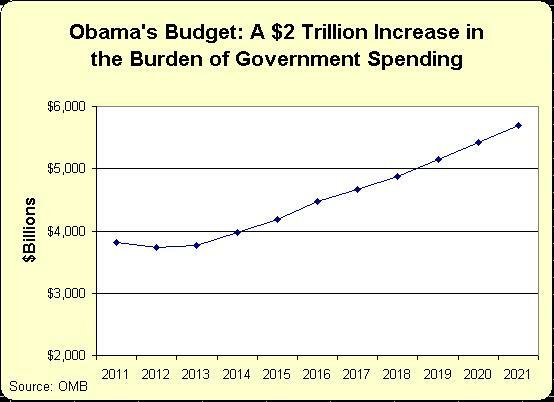 That’s why the most important number in Obama’s budget is the $5.7 trillion burden of spending in 2021. That’s a mark of fiscal failure, and it exists because Obama’s budget increases spending at twice the rate of inflation between 2013 and 2021. Third, many people have appropriately criticized the White House for moving the fiscal goalposts (oops, another metaphor) and focusing on a technical budget concept known as “primary deficit” or “primary balance” instead of traditional budget measures. This is an arcane issue involving the difference between total spending compared to overall spending minus interest payments. Yes, the White House is being slippery, even earning a false rating from PolitiFact, but this is red herring (there I go again) issue. What really matters is the size of government, not regular deficits or primary deficits. Too many Republicans are fixating on the symptom of too much borrowing and paying insufficient attention to the underlying disease of too much spending. This video explains further.